Doha: Five years ago Samer Habib left the UAE and moved to Qatar where he opened a restaurant that turned a profit serving Lebanese salads and sandwiches to expats. “Customers keep coming to me and saying: ‘Samer, this is my last sandwich’,” he said. “They say it’s been a tough year.” Like other Gulf states heavily dependent on energy sales, Qatar — the world’s top liquefied natural gas exporter — has sought to cushion the impact of lower oil prices on its finances by raising utility bills and slashing spending. Businesses that rely on the custom of professional foreign workers with their tax-free salaries and disposable income, including restaurants like Habib’s, private schools, car dealerships and shopping malls, could struggle to survive. In 2015 state-run Qatar Petroleum let more than 1,000 foreign workers go as part of restructuring, according to the energy minister. Al Jazeera, the pan-Arab satellite news network owned by Qatar, closed its American channel in April and has laid off 500 staff, most of them in Doha. Vodafone’s Qatar subsidiary said in May it would cut about 10 per cent of its workforce. It is unclear exactly how many of Qatar’s 1.6 million foreign workers are departing, and the country’s population is still growing due to an influx of Asian workers building highways and stadiums for the 2022 soccer World Cup. But industry sources, including three company CEOs, said that job cuts were widespread and tens of thousands of white-collar workers had been laid off in the last two years. A Facebook group set up in March for departing expatriates in Qatar selling cars and second-hand furniture has over 50,000 members and is updated hourly. The small country is astonishingly wealthy one of the richest in the world per capita — but faces a $12.8 billion (Dh47.02 billion) budget deficit this year, its first in over a decade. The government in December halved its forecasts for economic growth and last month said it expects to run a deficit for at least three years as low natural gas and oil prices strain revenues. The layoffs could further weigh on the economy. Hotels, malls and private schools — projects conceived when oil prices were high and Qatar’s winning of the 2022 World Cup was driving infrastructure and population growth — now compete for the custom of a dwindling middle class of professionals. Mohammad Al Emadi, a real estate tycoon who has developed a $1 billion luxury shopping centre in Doha that will open in September, said the mall’s cafés and fashion boutiques will have no trouble drawing customers. 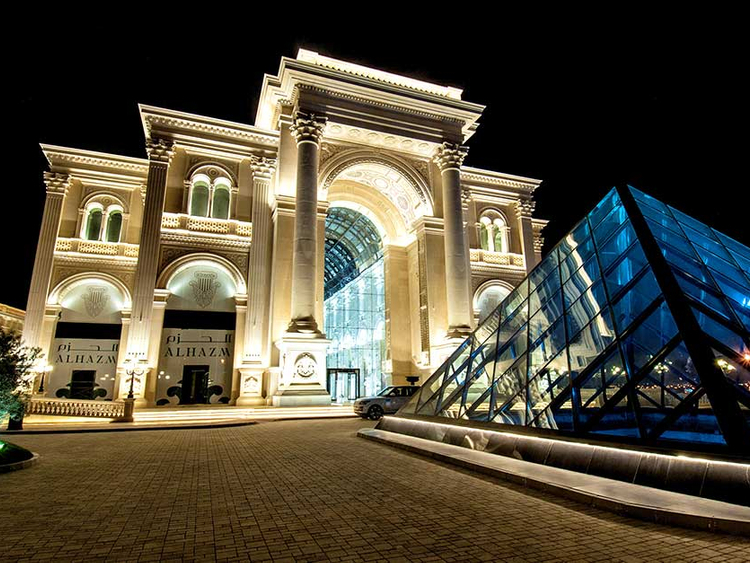 But he concedes were it not for the project’s eye-catching design — a marble structure modelled on a 19th century Italian galleria with shops tailored to super-rich Qataris, whose jobs have survived the austerity — his business might be in trouble. “Ten to 12 malls are currently being built in Qatar and soon they will open,” Al Emadi said, adding that some mall owners were having to drop rent prices to attract tenants. Two other malls are set to open later this year — the Doha Festival City and the Mall of Qatar, a building equivalent in size to 50 football pitches with over 500 stores. Both projects have delayed their opening dates. Hotel owners, too, have concerns about an oversupply with government spending cuts affecting business tourism and leading to a 19 per cent decline in hotel room prices in dollar terms this year, according to Ernst and Young. “Building will drive demand. We are thinking long term, beyond 2022 [World Cup], and looking at areas of growth like regional tourism from the Gulf. Of course there is still room for malls and hotels ... these things are encouraging people to visit and work here,” said a Qatari government official. Some businesses, though, spy an opportunity in the exodus of workers. Second-hand car dealers in Doha run a lucrative trade buying used sports cars from foreigners departing in a hurry, which are then shipped and sold in Asian markets. “Bentleys, Porsche GTs, SL63 Mercedes ... pretty much every day we see one brought in,” said a Western businessman who has run a car dealership in the city for over a decade.